This is a side dish in Indian meals. This dish is made out of skin (peel) of ridge gourd(Heerekai/Turai). It is used as a side dish for rotis, chapati, paratha and any type of rice. In normal course, we peel off skin of ridge gourd and through it out. Most of us have less information about ridge gourd skin, it is good source of dietary fiber. It has excellent blood purifying properties which helps to purify, restore and nourish liver.This dish is very healthy and tasty. It will take hardly 10 – 15 minutes for preparation. This is, actually, a rural culinary, rural people prepare this dish as main side dish for rotis and they prepare only one side dish for their whole meal. You can make this dish as much hot as you like. Let’s see the preparation of heerekai sippe bharta. 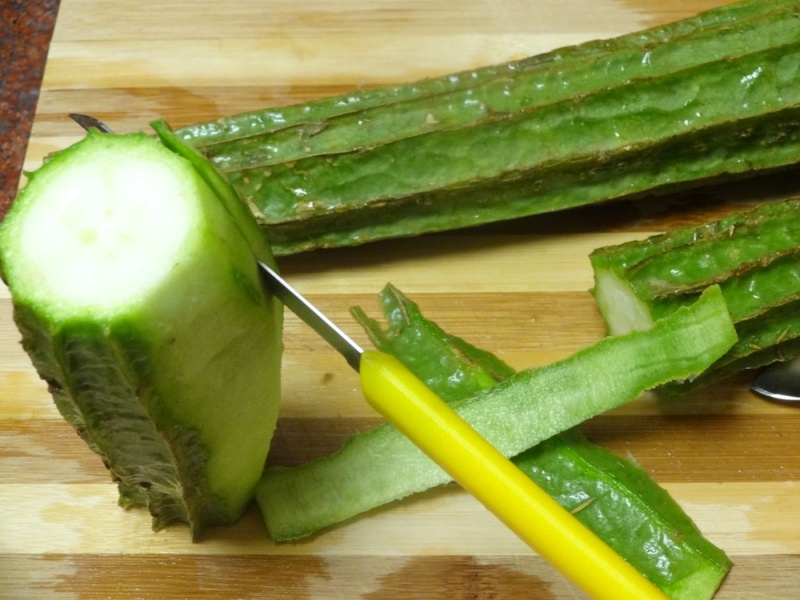 First you have to taste the heerekai (ridge gourd) with skin, cutting the edge of it. Sometimes they taste bitter. If it tastes bitter, don’t use it for bharta, otherwise taste of the bharta will be spoiled. After testing the taste of all ridge gourd, peel off skin of ridge gourd, take the skin and chop it into small pieces and keep it in a bowl. You can prepare some other recipe from the remaining part (inner part) of the ridge gourd as side dish for rotis, chapatis and rice. You can prepare hot bhajis (savoury snacks), dall or sabji (palya/veggies). Heat a pan on medium flame, pour 1 tea spoon oil to it. After 1 or 2 minutes, add groundnuts and sesame seeds (til), roast them together for 2 minutes and then add green chilly to it. While adding green chilly, break chilly in to 1 or 2 pieces, so that they will not split wildly after adding them in oil. Roast them in oil along with groundnuts and til for 2 minutes. Add chopped ridge gourd skin and 1/2 tea spoon salt and mix them well, close the pan with lid. Allow it to cook for 5 minutes on low flame. After 5 minutes, remove the lid and check whether the skin has become soft or not. If skin is softened, it means it is cooked properly, otherwise it has to be cooked for another 2-3 minutes closing the lid. Remove the pan from heat, leave it to cool down for 10 minutes. Heat a small pan on medium flame, pour remaining oil to it. Add mustard seeds, wait until they split, add cumin seeds and hing to it, remove it from heat immediately. When mustard seeds start splitting, it means temperature of oil is very high, whereas cumin seeds require very less heat to split. If you leave it on heat after adding cumin seeds, the whole seasoning will be spoiled. Keep it aside. Take a mixer jar, pour all cooked stuff to it, add remaining salt, chopped coriander leaves to it. Grind it coarsely by adding a very little quantity of water (around 1 or 2 table spoons) so that ingredients will mix well and paste will be little bit thicker. Take out the paste to a bowl, add remaining salt, black pepper powder and curds to it. Mix it well with the help of a spoon. Pour the tadka (seasoning) to it. Mix it well so that bharta should absorb all oil. Now tasty, healthy and delicious bharta is ready to serve.